The last flying FJ-4 in United States Navy colors. The North American FJ Fury was the first operational jet aircraft in United States Navy service. Ordered in late 1944 as the XFJ-1 in competition with proposals from Douglas and Vought, the Fury began as a straight-wing, tricycle gear fighter with a single turbojet passing through the fuselage. The wing, empennage and canopy strongly resembled that of the piston-engined P-51 Mustang, North American's highly successful World War II fighter. The design was also the basis for the design of the XP-86 prototype of the United States Air Force's F-86 Sabre. The first flight of the prototype XFJ-1 took place on September 11, 1946, with the first of thirty deliveries beginning in October of 1947. The Fury's first landing on an aircraft carrier was made March 10, 1948 aboard USS Boxer. Flown operationally by Navy squadron VF-5, the FJ-1 pioneered jet-powered carrier operations and underscored the need for catapult-equipped carriers. The Fury was capable of launching without catapult assistance, but on a crowded flight deck the capability was of small practicality. As straight wings were seen at the time as the only way to ensure the low speed and stability needed for carrier landings, the FJ-1 used a straight wing. By 1951, the Navy's existing straight-wing fighters were much inferior in performance to the swept-wing Soviet MiG-15 then operating in the Korean War; the swept-wing fighters in the Navy's development pipeline, including the F7U Cutlass and F9F Cougar were not yet ready for deployment. As an interim measure, Navy purchased three swept-wing F-86E Sabres with Navy-specific equipment and strengthened airframes. The three planes began flight testing in December 1951 under the designation XFJ-2. The design was eventually put into production as the FJ-2, but construction was slowed due to demand for the F-86 in Korea; the FJ-2 was not produced in large numbers until after that conflict had conculded. By then, because of a weak nose gear and arrestor hook on the FJ-2, the Navy preferred the F9F Cougar due to its superior slow-speed performance for carrier operations, and the 200 FJ-2 models built were delivered to the United States Marine Corps (as had been happened to the F4U Corsair during World War II). A Fury displayed on the flight deck of the USS Intrepid museum ship. The development of the FJ-3, which was to be powered by a license-built version of the new Armstrong Siddeley Sapphire turbojet, resulted in its first flight in July 1953. Deliveries began in September 1954, and the FJ-3 joined the fleet in May 1955. An FJ-3 was the first fighter to land aboard the new supercarrier USS Forrestal in 1956. 538 FJ-3s were built, including 194 FJ-3Ms with the ability to carry AIM-9 Sidewinder air-to-air missiles. Some FJ-3s were later modified to control Regulus and F9F-6K Cougar target drones. In 1955 the Navy added the new wing design that had been successful on the F-86F, providing space for additional fuel, and in 1956 retro-fitted all its FJ-3s with probe-and-drogue air refueling equipment. The final versions of the Fury were the FJ-4 and FJ-4B, which featured several improvements on previous versions. Internal fuel capacity was increased, necessitating a distinctive, taller 'razorback' rear deck. The tail was modified, as were the wings, to provide more positive control and stability during carrier landings, and the landing gear was widened. Delivery of FJ-4s began in February 1955, and except for one squadron which trained Navy FJ-4B pilots, FJ-4s were used exclusively by the Marine Corps. The FJ-4B was a fighter-bomber version, capable of carrying double the underwing stores, including nuclear weapons on a single station. 152 FJ-4s and 222 FJ-4Bs were produced. With the new designation system adopted in 1962, the FJ-4 became the F-1E and the FJ-4B the AF-1E. AF-1Es served with United States Naval Reserve units until the late 1960s. 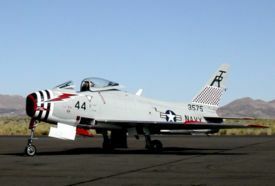 The FJ Fury was the first aircraft of the VF-84 incarnation of the legendary Jolly Rogers Squadron. A total of 1,115 Furies were received by the Navy and Marine Corps over the course of its production life. ↑ Baugher, Joe; Hal Humphrey (2002-11-03). North American FJ-4 Fury. American Military Aircraft. Retrieved on 2006-04-08. This page was last edited on 6 March 2007, at 07:47.